In 2009, First Baptist Church in Blountstown, FL began talking to Laws Stained Glass Studios about their existing faceted glass windows. The windows were made in 1975 by L.L. Sams. L.L. Sams was a large church furnishing company based out of Waco, TX that is now out of business. Laws examined the windows. Some daylight was coming in around some of the glass and epoxy. All of the steel frames were rusty. In some places, the steel was completely gone. It had rusted away. The church decided to replace the windows with new faceted glass windows and new aluminum frames. In 2014, Laws Stained Glass Studios made (26) new faceted glass windows. The six large sanctuary windows were size 35-1/2" wide by 183" high. Laws began the installation by removing the existing faceted glass windows and the steel frames. Laws installed new dark bronze aluminum frames into the brick openings. The new faceted glass windows were set into the aluminum frames. Existing faceted glass window made by LL Sams in 1975. Note how some of the light pieces look nearly clear. 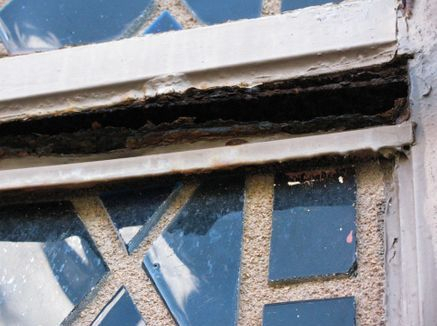 Close-up showing how corroded the steel frame was. New dark bronze aluminum frame and faceted glass installed into the existing brick opening.